We know, we know. You’ve been wondering lately if your little one isn’t maybe just a little bit droid. She stumbles around all day, making high pitched squeaking and bleeping and blooping noises. And even though her words are totally unintelligible, you understand her completely. And what’s that? She is also unafraid to just expel waste wherever she sees fit? Yup, to us it sounds like you might just have a little droid rolling around your brand new condo, tracking in mud and/or oil. But that’s ok! 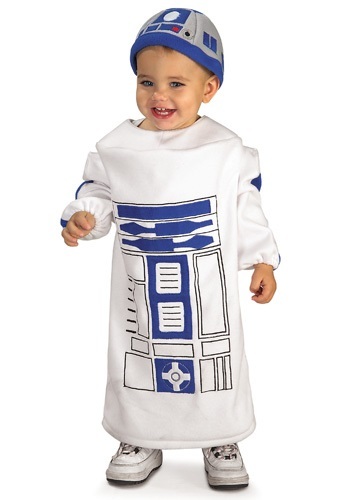 Trust us, if you dress her up in this Child R2D2 Costume, she’ll feel right at home as the tiny droid that helped save Naboo, Yavin 4, Anakin Skywalker, Obi-Wan Kenobi, Luke Skywalker, and pretty much the entire Rebellion several times over the course of….several decades. Just be careful, in this outfit, she may be inspired to do more than just bleep and bloop around. In true R2D2 fashion, she may try to fix the oven, or switch out the electrical fuses, or maybe just give the cat a good electrical shock for annoying her. So maybe keep an eye out for that. We all know R2D2 was the greatest droid made in the galaxy, just like you know that about your little one. And in this polyester and flannel costume, complete with the printed droid front and adorable R2D2 cap, you can let her fulfill her true calling--a one-of-a-kind, comic relief, world saving, indestructible character that is loved by all.